Historic Lambeau Field, home of the Green Bay Packers. Located in De Pere, Wisconsin, we’re just five miles south of Green Bay. That means we’re minutes from historic Lambeau Field and countless attractions, restaurants and entertainment venues you’ll want to explore. In the heart of the “New North” – the 18 counties that make up northeast Wisconsin – we’re also within driving distance of Milwaukee; Chicago; Madison, Wisconsin; and the Twin Cities in Minnesota. Take Interstate 43 North or U.S. Highway 41 North to the Green Bay area. From U.S. Highway 41: Exit at Main Avenue in De Pere. Bear right through the roundabout and take Main Avenue east through four sets of lights. Main Avenue will eventually turn to the right and become Reid Street. Get in the right lane. When you go through the third set of lights on Reid Street, the campus will be in front of you and to your right. From I-43: Exit on Highway 172 (exit number 180) and watch for the St. Norbert College sign at the Webster Avenue exit. Take the exit and proceed to Riverside Drive. Turn left onto Riverside Drive and proceed through the historic Broadway neighborhood. After about a mile, turn right at the two-lane roundabout onto the Claude Allouez Bridge. You’ll catch your first glimpse of our beautiful St. Norbert College campus across the river as you look to your left. Turn left at the first stoplight after the bridge, onto Fourth Street. Turn left again at the next stoplight onto Reid Street and move to the far right lane. The campus will be in front of you and to your right. Take U.S. Highway 41 South to the Main Avenue exit in De Pere. Bear left through the roundabout and take Main Avenue east through four sets of lights. Main Avenue will eventually turn to the right and become Reid Street. Get into the right lane. When you go through the third set of lights on Reid Street, you’ll see the campus in front of you and on your right. From Wisconsin 29: Go east to U.S. Highway 41 South to the Main Avenue exit in De Pere. Bear left at the roundabout and take Main Avenue east through four sets of lights. Main Avenue will eventually turn to the right and become Reid Street. Get into the right lane. When you go through the third set of lights on Reid Street, you’ll see the campus in front of you and on your right. From U.S. Highway 10 or Wisconsin 21: Take either route to U.S. Highway 41 North. Exit at Main Avenue in De Pere. Bear right through the roundabout and take Main Avenue east through four sets of lights. Main Avenue will eventually turn to the right and become Reid Street. Get in the right lane. When you go through the third set of lights on Reid Street, the campus will be in front of you and to your right. Exit the airport and bear right onto Wisconsin 172 East for about two miles. Exit U.S. Highway 41 South/De Pere exit. Take U.S. Highway 41 South to the Main Avenue exit in De Pere. Bear left through the roundabout and take Main Avenue east through four sets of lights. Main Avenue will eventually turn to the right and become Reid Street. Get into the right lane. When you go through the third set of lights on Reid Street, you’ll see the campus in front of you and on your right. The Kress Inn offers complimentary parking for its guests. Additionally, lots P14 and P11 are available for visitors. See our parking webpage for more information. Can’t make it to campus? 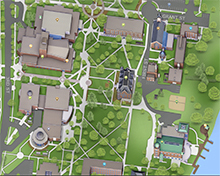 Our interactive map will give you a sense of our beautiful riverfront campus.